D-flat minor is a theoretical key based on the musical note D♭. Its key signature has seven flats and one double flat. 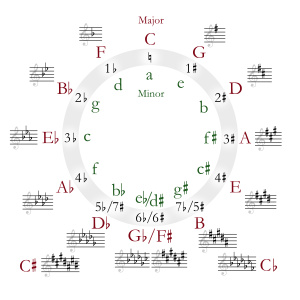 Because it has so many flats, D♭ minor is usually written as its enharmonic equivalent of C♯ minor. For example, Mahler's thematic motif "der kleine Appell" ("call to order") from his Fourth and Fifth Symphonies is written in D♭ minor in Symphony No.4, but in his Symphony No. 5 it is in C♯ minor. In the Adagio of his Symphony No. 9 a solo bassoon theme appears first in D♭ minor, but comes back two more times notated in C♯ minor. The Adagio of Bruckner's Symphony No. 8, also has phrases that are tonally in D♭ minor but written as C♯ minor. ↑ Thomas Busby (1840). "D Flat Minor". A dictionary of three thousand musical terms. revised by J.A. Hamilton. London: D'Almaine and Co. p. 55. ↑ Ernst Levy (1985). A Theory of Harmony. SUNY Press. p. 62. ISBN 0873959930. ↑ James L. Zychowicz (2005). "Structural Considerations". Mahler's Fourth Symphony. Oxford University Press. p. 28. ISBN 0198162065. ↑ Theodor W. Adorno (1992). Mahler: A Musical Physiognomy. Translated by Edmund Jephcott. University of Chicago Press. pp. 165–166. ISBN 0226007693. This page was last changed on 11 March 2013, at 12:42.